Annihilation chronicles the twelfth expedition into Area X, as recounted by their biologist. Honestly, I’m half tempted to just leave this review at ‘wow,’ because I’m not sure that anything else I say is going to be able to better describe my response to Jeff Vandemeer’s beautifully haunting novel, Annihilation. This was my introduction to Vandemeer’s work – and to the ‘New Weird‘ genre – and, I must admit, I think I’ve become an immediate fan of both. 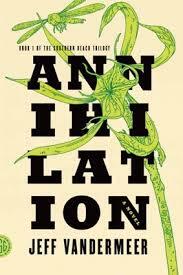 My admiration was hard-earned though, as I found myself struggling to connect with the narrator of Annihilation, known only as the biologist, whose prose was at all times wonderfully descriptive yet frustratingly impersonal, despite the ongoing divulgence of details about her personal history, and the inner workings of her mind. That she made repeated references to wanting to remain objective in her account of the fate of her expedition might have made a certain kind of logical sense – particularly given her nature – but that didn’t mean that this was an emotionally fulfilling justification. So, yes, I struggled through the first…twenty? pages of Annihilation. By which point I realised with some degree of surprise that I’d unknowingly reached a kind of critical mass, where I was being dragged along by the unfolding story, and could not put the book down. It was all just so vivid, so mysterious, so amazing, so unsettling, that I needed to know where things were going. Having now finished, part of me is feeling stunned – as if I’ve been unwillingly pulled from a surreal dream (or nightmare) that’s still lingering on the edge of my waking mind. Part of me wants to go back and re-read it again; another part of me wants to immediately move on to the second book in the trilogy; and another part of me feels like I need time to process what I just read before I even consider what my next move will be. Addendum: In the few days since originally writing this post, I’ve finished Authority and Acceptance. And, while the wow factor may have worn off a bit over time (in part, I think, because neither of the next two books had quite the same ‘oomph’ to them), there’s still something there that had me reading all 600+ pages in quick succession. There are a couple of points where VanderMeer’s use of abstraction becomes too abstract, and what should’ve been moments of high drama instead became moments of struggling to understand, or visualise, what was going on. And the use of a second person narrative in some chapters of Acceptance is just so against the grain of the rest of the books that these chapters were universally jarring for me. Still, even if I wasn’t as excited about finishing the third book as I was the first, I stand by what I’ve written above. There is something hauntingly beautiful about this trilogy.